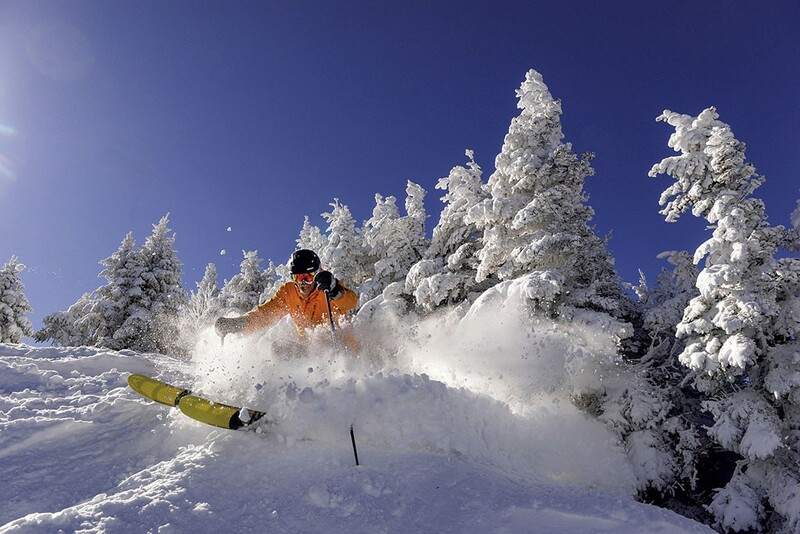 Come deep winter, snow whitewashes Vermont from its peaks to its valleys. While the view is good from any elevation, the mountains call out this time of year, promising skiers and riders ripping run after run down their powdery slopes. 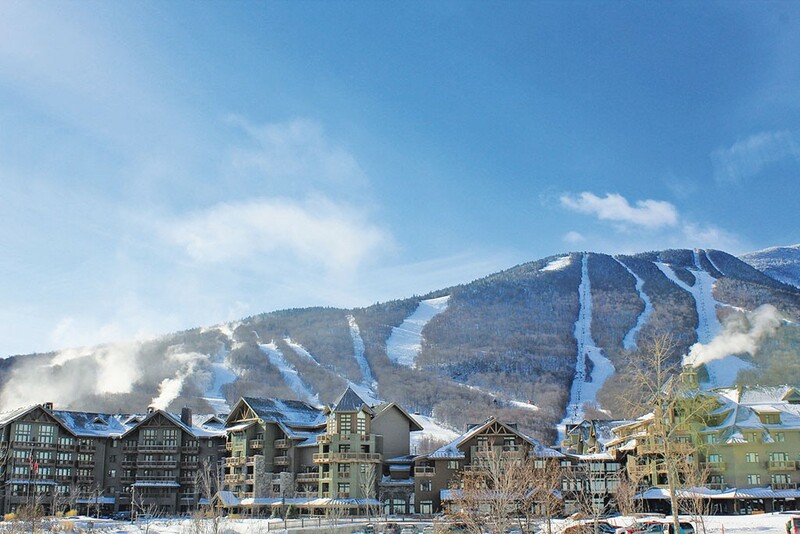 Take your pick of mountain resorts — there’s a handful within an hour’s drive of Burlington. They’re full of classic trails that can make athletes of all levels feel like champions. But they also hit the mark when it comes to off-piste adventures, cozy indoor amenities and an abundance of nearby après-ski eats. It’s more than enough to make you head for the hills. In less time than it takes to get a pizza delivered, skiers and riders can be slicing up the 5,000 snow-covered acres at Bolton Valley Resort. It’s located just 30 minutes from downtown Burlington. The most popular terrain from the 3,150-foot summit tends to be the Timberline Quad’s long intermediate trails. From Vista Peak, experts can hit the glades for tree-skiing, while beginners snowplow down Sherman’s Pass or learn their first turns off the Mighty-Mite rope tow. It’s at night, however, that this place really lights up, with 10 illuminated runs beneath the Vista Quad offered Wednesday through Saturday. The Nordic Center here allows access to 100 kilometers of cross-country trails and some of the state’s best backcountry terrain. This includes the iconic Bolton-Trapps section of the 300-mile Catamount Trail, which traces the entire spine of Vermont. The beefy burger is a delicious follow-up to downhill diversions at this pub in tiny Richmond, 10 miles from the resort. Pair it with rosemary fries and a beer, wine or cider from one of 24 taps. The chefs here cook up solid mountain fuel for breakfast, lunch and dinner. Head to the counter to order southern-fried chicken, mac and cheese, or an apple fritter. The southern-style meals at this Waterbury restaurant are award winning. When you’re fresh off the slopes, though, try the casual brewery in the back. Sip a house-brewed brown ale or coffee-oatmeal stout with a taco or two. 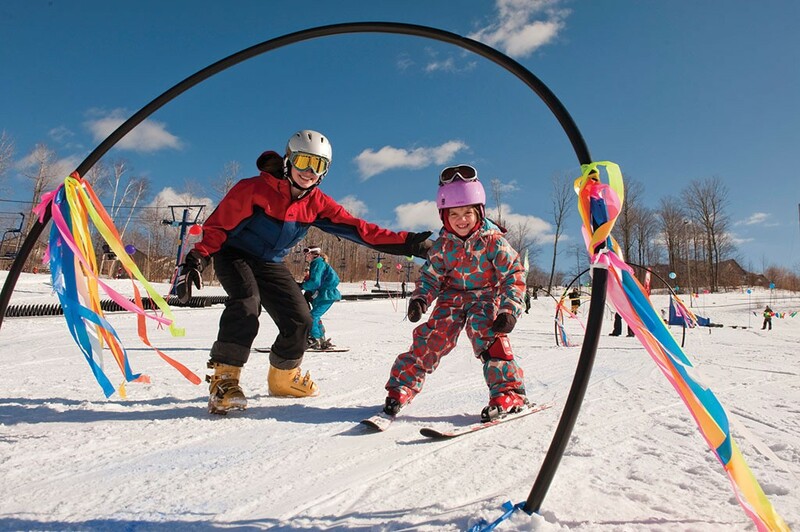 Children learning to ski typically take a turn for the better at this three-mountain resort, 45 miles from Burlington. That could be thanks to a pair of fuzzy mascots — Mogul Mouse and Billy Bob Bear — who romp around the grounds, ensuring that ski lessons stay fun. Look for them hosting races on Sir Henry’s Hill or serving hot chocolate in between snow-tubing sessions. There’s plenty to keep the adults entertained, too — namely, the fresh snow that sticks around here long after it’s gone at some other Vermont resorts. The secret? An average annual snowfall topping 26 feet, and slower ski lifts, which serve to reduce crowds. So waiting in slightly longer lines pays off in powder stashes, especially off Madonna and Sterling peaks. Back at the base area, indoor pools and whirlpools tempt athletes with a relaxing soak — but trekking out to see the frozen waterfalls of the actual notch, separating Jeffersonville from Stowe, might prove more fun. Made friends on the mountain? Bring them here and bond over a basket or two of the house chips, covered in salt and sugar. Wash them down with a margarita made with local apple cider. The hearty fare at this chef-owned restaurant will speed recovery after an exhausting day on the slopes. Try the gourmet take on an open-faced hot turkey sandwich; it comes with sage gravy. 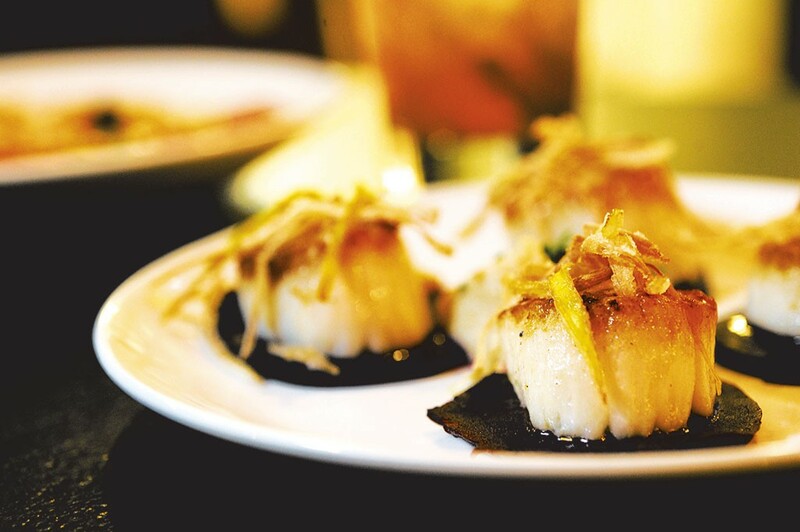 Sit downstairs at the main restaurant for a diverse menu ranging from rare-tuna nachos to classic meatloaf. For a quick slice, head upstairs to the Jeffersonville Pizza Department. 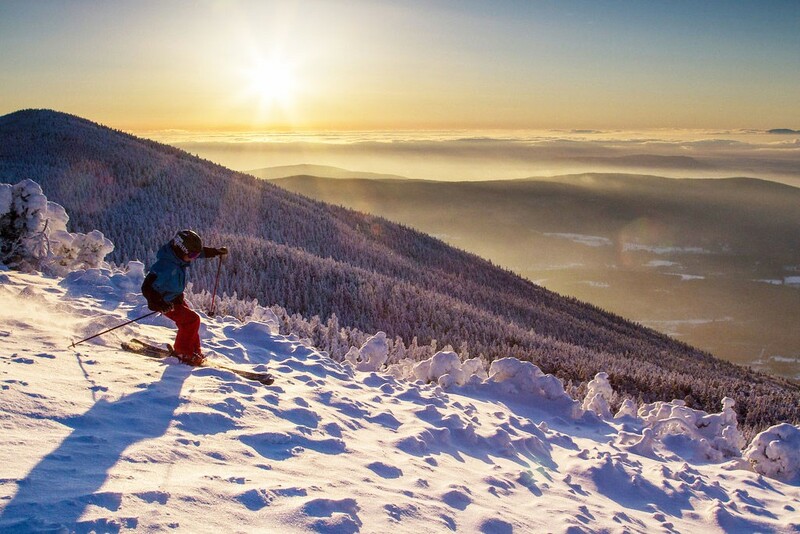 Located on Mount Mansfield, Vermont’s largest peak, Stowe Mountain Resort is about as close as the East gets to the pampering and powder of the American West’s much larger Rocky Mountain resorts. This popular spot, 43 miles from Burlington, is known for its fabled Front Four — a quartet of spine-tingling steeps spilling from the 4,396-foot summit — as well as its castle-like luxury lodges and the nearby plush spas and sushi spots. Start your exploration at the beginner-friendly Spruce Peak area or by meandering down the Toll Road, a winding beginner run nearly four miles long that hosts the famous Stowe Derby race every February. Work your way up to such classic intermediate runs as Hayride and Perry Merrill. For those not ready to tip down the Front Four (named National, Goat, Starr and Liftline), other adventures abound. Try soaring through the skies on the new zip line, spending the night in the Stone Hut cabin or simply submitting to a hot-stone massage at one of the many Stowe spas. 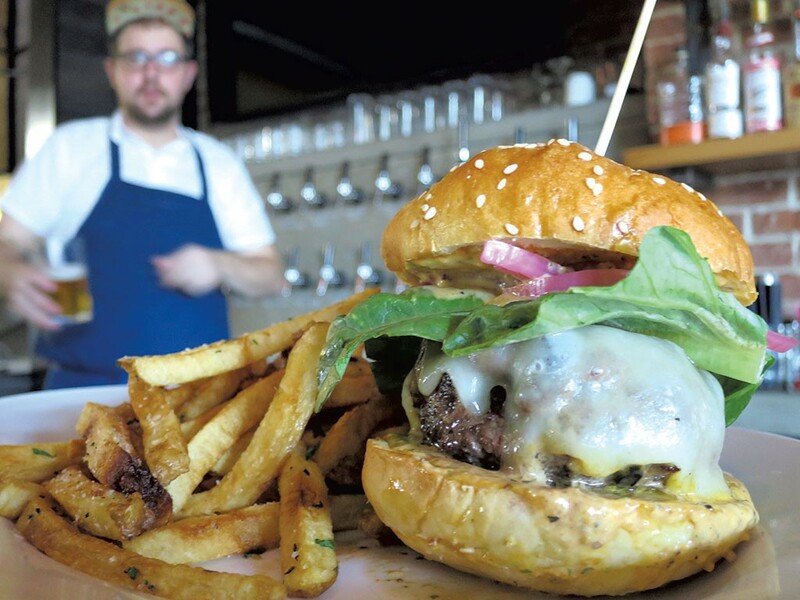 Twenty-eight taps of mostly local brews are the main attraction at this comfort-food spot. 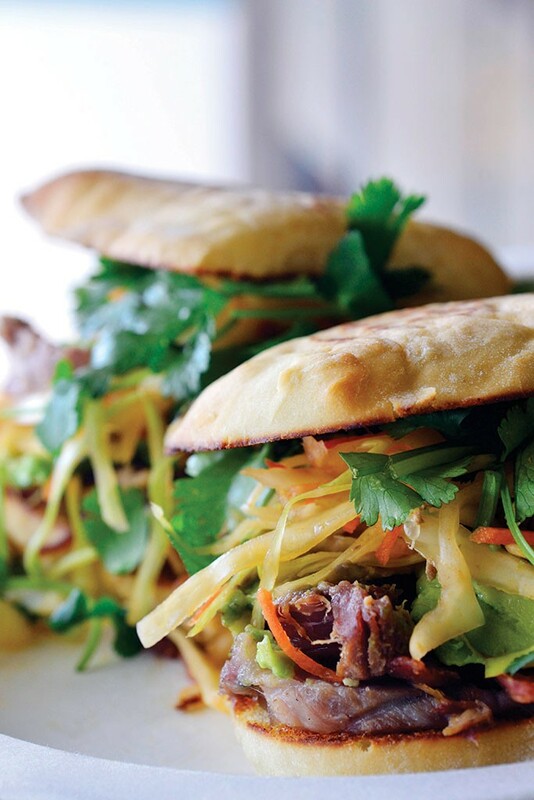 It specializes in burgers and wood-fired pizzas, and offers fancier fare, too — think wood-roasted duck. A rocket scientist is in charge of the beer list here, which includes 24 taps and a long list of bottles. Shared ownership with the beloved upscale mini-chain Hen of the Wood guarantees great food in a more casual atmosphere. This Japanese restaurant makes a special effort for its après-ski guests. There are free wings at the bar from 3 to 6 p.m., a great way to warm up, along with some hot sake. Watch out, Winter Olympic fans: The next gold medalist just might hail from Vermont’s Mad River Valley, which generates more elite ski racers, freestyle skiers and snowboarders than nearly anywhere else. This corner of the state, just under an hour from Burlington, is simply made for winter sports. Sugarbush Resort’s Lincoln Peak base area has all the bells and whistles that a skier or rider could need: the elite Green Mountain Valley School for student ski racers, lessons for all ages and king-size beds to collapse into at the end of the day. Its Mount Ellen boasts the highest chairlift in Vermont. The corridors of tree-skiing and backcountry terrain here keep visitors coming back right up until the spring thaw. Over at nearby Mad River Glen, the teasing motto “Ski it if you can” references the site’s all-natural features and limited snowmaking. If conditions aren’t prime, indulge instead in one of Sugarbush’s Cabin Cat dining adventures, which transport visitors to the top of Gadd Peak for a fireside feast in Allyn’s Lodge. Just for skiers, there’s a grazing menu available from 3 to 6 p.m. Small plates include kirsch-spiked fondue, spicy shrimp and grits, and braised beef dumplings. Drink craft beers or a margarita with farm-fresh Mexican dishes at this quirky taqueria. Don’t miss flavoring your carnitas or roasted yam taco with some of the creatively named housemade hot sauces. For a true taste of place, try the Vermont Vibes pizza, topped with ham, Granny Smith apples, cheddar and a drizzle of maple syrup. Finish on a sweet note with a flavored waffle or dessert calzone. Au plus fort de l’hiver, du plus haut sommet au creux des vallées, le Vermont se couvre de blanc. La vue est superbe partout, mais durant cette période de l’année, ce sont les montagnes qui volent la vedette, pour le plus grand plaisir des skieurs et des planchistes qui prennent d’assaut les pentes enneigées. Une foule de stations de montagne s’offrent à vous à moins d’une heure de voiture de Burlington. Outre les pistes classiques, où les sportifs de tous les niveaux se sentiront comme des champions, vous pourrez profiter d’aventures hors des sentiers battus, d’aires de détente chaleureuses à l’intérieur et d’une abondance de restaurants pour un « après-ski » bien mérité. Voilà autant de bonnes raisons de mettre le cap sur les montagnes. En moins de temps qu’il n’en faut pour faire livrer une pizza, skieurs et planchistes peuvent se précipiter au Bolton Valley Resort, qui s’étend sur 5 000 acres à 30 minutes seulement du centre-ville de Burlington. Les longues pistes de niveau intermédiaire du télésiège quadruple Timberline sont les plus prisées de cette station, qui culmine à 960 mètres. De Vista Peak, les experts peuvent faire du ski de forêt à travers les clairières. Les débutants pourront quant à eux descendre Sherman’s Pass en chasse-neige ou pratiquer leurs premiers virages sur la pente de Mighty-Mite, accessible par câble de remontée. La nuit tombée, du mercredi au samedi, les 10 pistes éclairées au-dessous du télésiège quadruple Vista brillent de mille feux. Le Nordic Center de la station offre 100 kilomètres de pistes de ski de fond et certains des plus beaux terrains pour le ski de randonnée nordique, notamment le pittoresque segment Bolton-Trapps de Catamount Trail, qui traverse tout le Vermont sur 483 kilomètres. Ce pub situé dans la minuscule ville de Richmond, à 16 km de la station, offre des saucisses sur bâtonnet bien costaudes, idéales après une rude journée sur les pistes. Accompagnez-les de frites au romarin et d’une bière, d’un verre de vin ou de l’un des 24 cidres en fût. Pour le déjeuner, le dîner ou le souper, les chefs de Parkside Kitchen vous proposent des mets copieux, parfaits pour la vie de montagne. Allez au comptoir et commandez du poulet frit à l’américaine, un mac and cheese ou encore un beignet aux pommes. Les plats typiques du Sud de ce restaurant de Waterbury ont tout pour plaire. Après vos descentes, venez profiter du cadre détendu qu’offre la brasserie, située en arrière. Dégustez une bière brune brassée sur place ou une stout café-avoine avec un taco ou deux. Les enfants qui apprennent à skier sortent toujours grandis de cette station sur trois montagnes, à 72 km de Burlington. C’est peut-être un peu grâce à Mogul Mouse et Billy Bob Bear, deux mascottes attachantes qui veillent à ce que les leçons de ski se déroulent toujours dans le plaisir! Vous pourriez les apercevoir en train d’animer des courses du côté de Sir Henry’s Hill ou de servir du chocolat chaud entre les séances de glissade sur tube! Les adultes ne sont pas en reste. Ici, la neige fraîche reste longtemps après être disparue dans d’autres stations du Vermont. Le secret? Des chutes de neige pouvant atteindre près de 8 mètres en moyenne et des remonte-pentes plus lents, ce qui réduit l’affluence. Il vaut donc la peine d’attendre un peu plus longtemps en file pour profiter au maximum de la poudreuse, particulièrement sur les sommets Madonna et Sterling. De retour au centre, il est tentant de se délasser les muscles dans les piscines et bains-tourbillon à l’intérieur, mais les plus vaillants ne manqueront pas de faire la randonnée jusqu’aux cascades glacées du fameux col (« notch » en anglais), qui sépare Jeffersonville de Stowe. Vous vous êtes fait des amis sur la montagne? Amenez-les ici et faites plus ample connaissance en partageant un panier ou deux de croustilles maison, assaisonnées au sel et au sucre. Rincez-vous le gosier avec une margarita faite avec du cidre local. Les plats réconfortants de ce restaurant dont le propriétaire est aussi le chef sauront vous ravigoter après une journée épuisante sur les pentes. Essayez la version gourmet du sandwich chaud à la dinde, servi ouvert avec une sauce au jus de viande à la sauge. Situé au rez-de-chaussée, le restaurant propose un menu diversifié, allant des nachos au thon cuit à point jusqu’au classique pain de viande. Envie d’une pointe de pizza? Montez à l’étage, où se trouve le Jeffersonville Pizza Department. 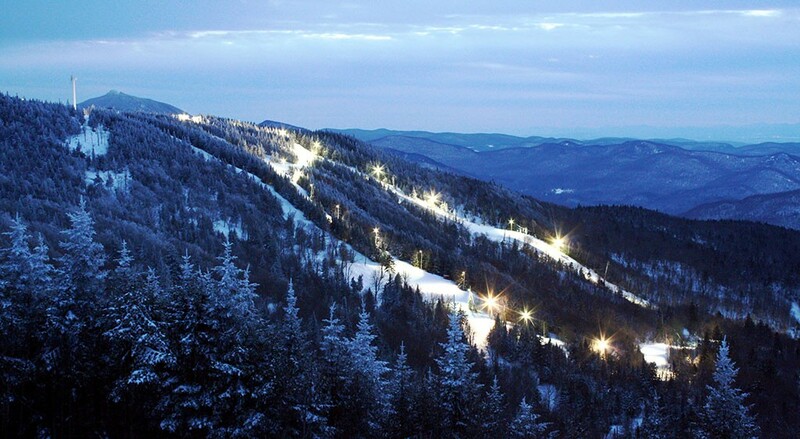 Situé sur le mont Mansfield, plus haut sommet du Vermont, le Stowe Mountain Resort est ce qui se rapproche le plus, dans l’Est, des centres de détente de l’Ouest des États-Unis, nichés dans les beaucoup plus imposantes Rocheuses. Ce lieu prisé, à 69 km de Burlington, est reconnu pour ses célèbres Front Four — quatre escarpements vertigineux taillés dans la montagne, qui culmine à 1 340 mètres — ainsi que pour ses établissements hôteliers luxueux, sans oublier les spas et restaurants de sushis situés à proximité. Commencez vos explorations dans le secteur de Spruce Peak, idéal pour les débutants, ou descendez doucement sur Toll Road, une piste sinueuse de près de 6,4 kilomètres où se déroule le fameux derby de Stowe chaque année en février. Empruntez ensuite les pistes classiques de niveau intermédiaire que sont Hayride et Perry Merrill. Si vous n’êtes pas prêt à affronter les Front Four (nommés National, Goat, Starr et Liftline), d’autres aventures s’offrent à vous. Essayez la nouvelle tyrolienne, passez la nuit dans la cabane en pierres ou laissez-vous simplement tenter par un massage aux pierres chaudes dans l’un des nombreux spas de Stowe. La sélection de 28 bières en fût, locales pour la plupart, constitue la principale attraction de ce restaurant au menu réconfortant : burgers, pizzas cuites au four à bois, sans oublier quelques mets plus raffinés, comme le canard rôti au feu de bois. Ici, un véritable spécialiste s’occupe de la carte des bières, qui comprend 24 variétés en fût et une longue liste de bières en bouteille. La copropriété avec la mini-chaîne haut de gamme Hen of the Wood garantit des aliments de qualité et une ambiance chaleureuse. Ce restaurant japonais réserve un traitement spécial à ses clients venus en « après-ski ». Des ailes de poulet sont servies gratuitement au bar entre 15 h et 18 h, une excellence façon de se réchauffer (le saké chaud est un excellent complément). Avis aux amateurs des Olympiques d’hiver : le ou la prochaine médaillé(e) d’or pourrait bien être originaire de Mad River Valley, une région qui produit plus de sportifs d’élite en ski de compétition, ski acrobatique et planche à neige que n’importe quelle autre, ou presque. Ce coin de l’État, à moins d’une heure de Burlington, est tout simplement fait pour les sports d’hiver. Le centre Lincoln Peak de Sugarbush a de quoi ravir skieurs et planchistes : on y trouve l’école Green Mountain Valley, qui offre des leçons aux skieurs de compétition de tous âges ainsi que de très grands lits où ils peuvent se reposer, le télésiège de Mount Ellen, le plus haut du Vermont, ainsi que des couloirs réservés au ski de forêt et un secteur de randonnée nordique, qui font le bonheur des visiteurs jusqu’au dégel du printemps. Tout près, à Mad River Glen, la devise « Ski it if you can » vous convie à profiter des attraits naturels du site, où la fabrication de neige artificielle est limitée. Si les conditions ne sont pas optimales, profitez de l’aventure gastronomique Cabin Cat de Sugarbush, qui transporte les visiteurs au sommet de Gadd Peak pour un festin auprès du feu, à Allyn’s Lodge. Cette taqueria excentrique propose des plats mexicains « frais de la ferme », que vous pouvez accompagner d’une bière artisanale ou d’une margarita. Ne manquez pas de rehausser vos tacos de carnitas (viande) ou de pommes de terre douces rôties avec l’une des délicieuses sauces piquantes maison aux noms plus créatifs les uns que les autres. Pour connaître le « vrai goût » d’ici, essayez la pizza Vermont Vibes, garnie de jambon, de pommes Granny Smith, de cheddar et d’un soupçon de sirop d’érable. Pour terminer, sucrez-vous le bec avec une gaufre aromatisée ou un calzone-dessert.